Diet Summary: After your Morning Flush Drink and stopping one hour before lunch, eat all the live FRESH fruit or if juice fasting, drink all vegetable juice you want. Beet juice is especially good. In general, do not mix your fruit and vegetable juices together (with the exception of carrot, apple, and celery--you can mix these together), and feel free to dilute your juices. (Certain combinations such as carrot and apple work together, but unless you know for sure, don't mix fruit and vegetable). Make sure to swish all juices thoroughly in the mouth before swallowing. Then, consume 4 droppers of Blood Support™ and 4 droppers of Liver Tincture™. Note: A dropper equals 1ml, as marked on the dropper. There’s no way to make these tinctures taste good. They are very bitter. Put your 8 droppers (4 of Blood Support and 4 of Liver Tincture) in about 1 oz. of juice (for this, bottled apple juice works fine) and shoot it down like a shot of bad whiskey. Then chase with a swig of plain juice to clean the palette. Turn on stove and simmer Liver Flush Tea for at least 20 minutes. Then turn heat to as low as it can go to keep the tea warm for you to scoop out as needed throughout the day. Note: You will want to strain out the small tea bits in your cup before drinking. Roughly chop 1 garlic clove (increase by 1 clove each day) and add to blender first. Then thinly slice a 1” piece of ginger (cut across the grain into 1/8 inch pieces to help break up the fibers) and add to blender along with the lemon juice. This will allow you to totally liquefy the garlic and ginger before adding the remaining ingredients and minimize any “chunking”. One other trick is to slice the chunks of ginger into smaller pieces across the fiber. This will prevent longer fibers from appearing in your drink. Once liquefied, add 1 tbsp. of olive oil (increase by 1 tbsp. each day), orange juice, and 8 ounces of pure water. Blend on high until well blended and frothy. Tip: Drink it down and follow with a fresh juice chaser to clear your mouth (if desired). Note: Many people really like this drink. They say it sort of tastes like a tangy Orange Julius. Here's why. Most people are not aware that fast food outlets rarely use any dairy in their "ice cream" shakes. They use vegetable oil. When you whip the oil at high speed, it gets creamy. Well, the same thing happens with the olive oil: when mixed in your blender at high speed, it makes the drink really thick and creamy -- as if there were ice cream in it. The tea helps with the flushing process itself, but also helps minimize any discomfort or nausea. The key herb in the tea is dandelion root, one of the strongest herbal lipotropics known. That is to say, it flushes fat deposits from the liver. Other herbs that you will find in the tea include things like: ginger, clove, cinnamon, burdock root, and horsetail. Incidentally, some of the other herbs used in the tea (such as uva ursi, parsley root, and juniper berries) are also extremely beneficial to the kidneys. Several cups can and should be consumed throughout the day. In fact, consuming the liver/detox tea as a regular part of your diet is a pleasant and tasty way to continually optimize your health. IMPORTANT: Any time between now and lunch, feel free to have some diluted fruit and/or vegetable juice. You don’t need to wait until lunch to have this, the point isn’t to starve yourself. This is not a fast, this is a cleanse. 2. For lunch, you can have more diluted juice. Feel free to add two, 3 gram packets of the Sun Chlorella to your juice. Continue to drink lots of water! If not doing juice for lunch, you may opt to have a raw vegetable or sprout salad. Absolutely do not use any oil or bottled dressing. You may add fresh lemon/lime juice or apple cider vinegar along with any fresh herbs and spices of your choice. Drink more diluted fruit and/or vegetable juice. Note: a couple of packets of Sun Chlorella taken daily with your juice will help give you energy and assist with the detox, and will also help with the detoxing and elimination. (If you don't have chlorella, you can use virtually any other pure green food such as spirulina, barley grass, green kamut, etc.) Jon Barron usually takes his two packets of chlorella with his juice at around 4:00 PM to get a lift in the afternoon and on into the evening. Continue to drink lots of water! Alternate: If not doing juice for dinner, you may opt to have a raw vegetable or sprout salad. Absolutely do not use any oil or bottled dressing. You may add fresh lemon/lime juice or apple cider vinegar along with any fresh herbs and spices of your choice. Mix 1 Tbsp. Psyllium Husks in 8 oz. of water and juice and drink quickly before it gets too thick. Note: The Psyllium Husks taken daily will help keep things moving and minimize toxic buildup. 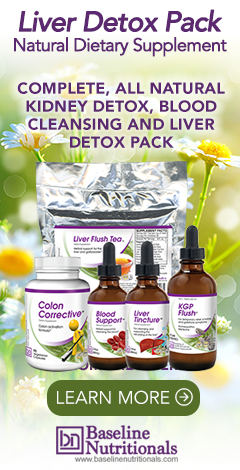 The cleaner you keep the colon during the detox, the better you’ll feel. if you are allergic to psyllium, use oat bran instead. Do NOT use ground flaxseed during the liver flush as it contains a lot of oil. Taking 1-2 capsules of the Colon Corrective usually is enough for most people. When you sit down on the toilet and say, “WOW! Did all that just come from me?”. If you have to ask yourself if you’re taking enough, then you’re probably not. Drink more water and Liver Flush Tea. Make Potassium Broth in preparation for tomorrow. Peel all the potatoes and reserve only the skin. Do NOT use the inside. Discard remaining potatoes (or put in a bag and set aside in the refrigerator for use after your cleanse). Add the skins to a large stock pot. Roughly chop the carrots, leaving skin on, and add to the stock pot along with the celery sticks. Slice the beets and add the sliced beets along with their greens to stock pot. Peel the onions and discard peel, then slice and add to the pot. If you purchased pre-peeled garlic cloves, add to the stock pot. If not, peel garlic cloves and add to pot. Add enough clean filtered water to the pot until it is filled to the top (the exact amount of water is not important, just enough to cover everything in the pot). Cover and simmer on low for 40-60 minutes. Strain out the vegetables and discard. Cool and drink broth. Refrigerate leftover broth in glass containers for use over the next couple of days. If desired, add some “Bragg Liquid Aminos” for flavor. Note: Potassium broth takes advantage of the fact that the outside of a potato is one of the highest plant sources of potassium. Tip: For one person, we recommend using a 6-8-quart pot. If making for two people, use a 12-quart stock pot. At night, turn off the heat to the Liver Flush Tea, top the pot off with water, add 2 more tablespoons of Liver Flush Tea to the mix, and repeat the simmering process in the morning. Each day, the tea just gets stronger and richer. When the taste gets too strong for you, pour out and start fresh. I ran into your website when I was looking for protoelitic enzymes. After reading your website I went to baseline for the product. Little did I know that soon after that I was diagnosed with fatty liver disease. Back to your website. I just wanted to take a moment to thank you for all the invaluable information you have here. I am on the first day of the liver cleanse and will keep you posted on how I'm doing. I ordered the tea the first time now i'm going to get the liver tincture and the blood cleanser. Again thankyou for all of the information. I believe it's going to save my life. Thank you Charlie for letting us know! I understand the health benefits and reasons for including garlic and onions, however I am unable to tolerate them. They generally upset my stomach and make me feel quite miserable. Should I leave them out, or is there anything to substitute that would be better than nothing? Or should I do the Alternate Cleanse instead? Thanks. You can leave them out. Keep us posted!